The latest 3D-printed accessory for the Nintendo Switch allows users to play their favorite games while lying down. There's a surplus of designs for Nintendo Switch accessories that players can print at home using their 3D printers. We've reported on a few in the past, including a 3D-printed peripheral that connected two Joy-Con controllers together so that one-handed players could enjoy Nintendo Switch games. Now there's a hot new 3D-printed accessory on the market, and this one allows players to enjoy the Nintendo Switch while lying down. It's being called the Nintendo Switch Visor, and the accessory as well as the relevant plans were upload to the NeoGAF forums by user Phawx, who seems to have no trouble in stating that the visor was created "for lazy people." Nintendo Switch owners will note that the Switch could always be played in bed through the Handheld gameplay mode or even the Tabletop mode, to say nothing of users that keep their Switch docked to television in their bedrooms. 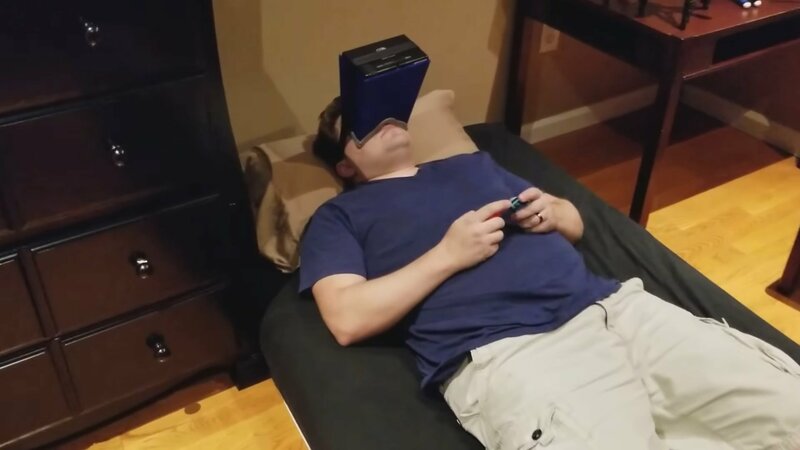 But this accessory is different: it uses a 3D-printed mold to mount the Switch directly to the player's face, much in the same way that common VR headsets mount atop players' heads. Phawx did include some smart design touches with his creation: the video shows how the Switch is secured to the visor, and references cutouts for the front-firing speakers as well as the choice to create a design that allows for full access to the headphone jack and cartridge slot. There's another nice touch too: interested Switch players can pick up the designs for Phawx's visor entirely for free and print them at home on their 3D printers. To check out the design, head over to the original NeoGAF post. Deck your Nintendo Switch out with protection and style by picking up one of the popular carrying cases we've featured on our list of the Best Nintendo Switch Cases.